If you are running SUSE Linux Enterprise 10, you will find the latest information in the Registering and Updating SUSE Linux Enterprise 10 article. Evaluation codes are available to Novell Technical Subscriptions "Developer" subscribers. These evaluation codes are active as long as the subscriptions are active. 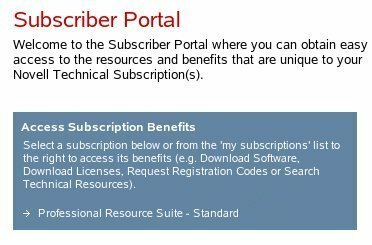 See Obtaining a Registration Code From Novell Technical Subscriptions. 30-day evaluation codes are available to anyone. See Obtaining a Free 30-day Evaluation Code. SLES can be purchased from Novell or a distributor as a single unit or with an electronic license agreement purchase. 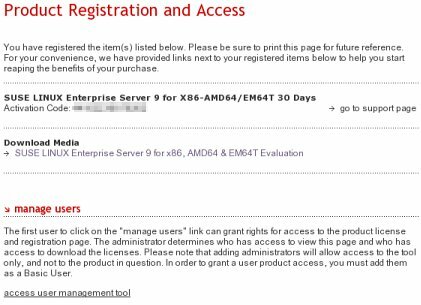 See Registering a Retail Version (Single Unit) of SLES and Registering a Novell License Agreement Purchase of SLES. Once a registration code has been obtained it must be linked to a Novell Account. This account can be used directly, or other accounts can be linked to it, giving multiple users access to the same registration code. For example, a large company can purchase several SLES licenses and then link an account for each server administrator so the administrators can update their servers with their own login credentials. After registration codes have been applied to a Novell Account and any additional users have been added, SLES is simply updated by using the built-in YaST Online Update mechanism by providing the Novell Account credentials. 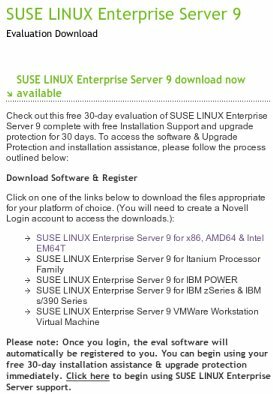 See Updating SUSE Linux Enterprise Server 9 for more information. Customers who have purchased a SUSE LINUX product in the past should be familiar with the SUSE Portal at http://portal.suse.com. Historically, all registration codes were managed through this portal. Novell is currently migrating the SUSE Portal functionality to Novell Accounts. All new customers must create a Novell Account and manage their products with Novell directly. A notice on the main SUSE Portal page explains this change. Existing SUSE Portal users can still manage their current products and register new products on the SUSE Portal. IMPORTANT: The SUSE Portal migration process might introduce some inconsistencies or glitches. This document highlights known problems and explains how to deal with them. SLES 8 is especially affected by the portal migration. The version of YaST Online Update in SLES 8 is not yet compatible with Novell's update servers. Those who purchased SLES 8 should continue to use the SUSE Portal until further notice. Go to http://www.novell.com. Select the my account link located near the top of the page (see Figure 1: Create a Novell Login). A login page is displayed. Select create new account. The next page has two steps: In step 1, enter the user profile information. If the account needs to be synchronized with any current Novell support, training, or channel accounts. Click next to go to step 2. Otherwise, click create login (see Figure 2: Decide How To Proceed). If create login is selected the account is created. If next is selected, then the synchronization process is performed. Enter any applicable information and select finish to complete the process (see Figure 3: Account Synchronization). When the registration process is complete, an email is sent to the address provided in the user profile. The email contains instructions for validating the email address. Registration of SLES requires a Novell Account. To obtain a Novell Account see Obtaining a Novell Account earlier in this document. For a general overview of the registration process please see the Overview. 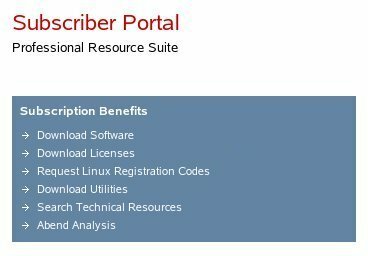 Login to the Novell Technical Subscriptions portal via http://support.novell.com/subscriptions. To access a registration code, select a subscription from the Access Subscription Benefits box (see Figure 1: Select Subscription). In the Subscription Benefits box, select Request Linux Registration Codes (see Figure 2: Subscription Benefits). A list of Linux products appears. To obtain a registration code for a specific product, click request code next to that product's name (see Figure 3: Obtain a Registration Code). 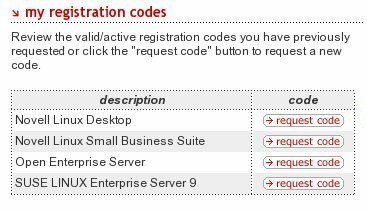 After the request code button is selected, a registration code appears in its place. To associate the registration code with a Novell Account, point a web browser to http://www.novell.com/reg/. Enter the registration code in the Activation Code box and click submit. The Product Registration and Access Page is displayed (see Figure 4: Product Registration and Access). The registration, or "Activation Code", is displayed. 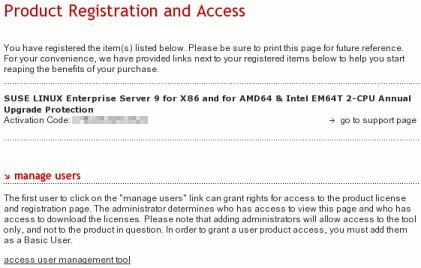 If desired, use the access user management tool link to give other Novell Accounts access to this registration code. See Using the User Management Tool for more information. A confirmation email is sent to the owner of the Novell Account. The email contains information about contacting Novell support and provides a contact ID. Note: When this article was written the email made reference to Novell Linux Desktop regardless of which product was registered. Ignore this. Evaluation codes for SLES are available at http://www.novell.com/products/linuxenterpriseserver/eval.html. The evaluation page contains instructions for obtaining an evaluation code (see Figure 1: Evaluation Page). To obtain the CD images and evaluation code for a desired platform, click the appropriate link. 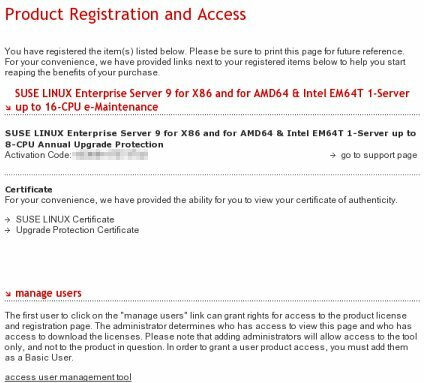 For this example, SUSE LINUX Enterprise Server 9 for x86, AMD64 & Intel EM64T is selected. Before selecting the link, be sure that either the desired Novell Account is logged in, or no account is logged in. If no account is logged in, a login screen is displayed. Log in as the desired user. A Product Registration and Access Page is displayed (see Figure 2: Product Registration and Access). This page displays the evaluation, or Activation Code and a link to download the CD images. Simply download the images and install the operating system. To install updates, refer to Downloading and Installing Updates. A single unit (boxed copy) of SLES can be purchased from many Online retailers. See http://www.novell.com/products/linuxenterpriseserver/howtobuy.html for more information on purchasing single units of SLES. A single unit of SLES includes the SUSE LINUX Enterprise Server 9 Start-up Guide, a brief instruction card, the CD media, and a registration card. The registration card contains the required registration code and a URL. A sample card is shown in Figure 1: Registration Card (Front and Back). Go to www.novell.com/reg. If nobody is logged in to a Novell Account, a login screen is displayed. Log in as the desired user. The next page has fields for an Activation Code and Product ID. Ignore the Product ID field and the note about using the SUSE Portal (see Figure 2: Enter Code). Enter the code and click submit. A Product Registration and Access Page is displayed (see Figure 3: Product Registration and Access). The registration, or Activation Code, is given on this page. Note: When this article was written the e-mail made reference to Novell Linux Desktop regardless of which product was registered. Ignore this. SLES can be purchase in mass using a Novell License Agreement (VLA) from Online retailers, or from Novell directly. See http://www.novell.com/products/linuxenterpriseserver/howtobuy.html for more information. After a purchase, an email is sent with more information about registering the copies. To register a product, click the link listed below the product in the email (see Figure 1: Registration E-mail). A web browser opens. If nobody is logged in to Novell Account a login screen is displayed. Log in as the desired user. A page may display the Novell Upgrade Protection terms. Read through the terms; then click agree at the bottom of the page. The registration code, or Activation Code, appears on this page. To obtain the CD images, go to http://download.novell.com. Like the SUSE Portal, a Novell Account allows the owner of a license to manage other users' access to that license. This is done with the User Management tool available on the Product Registration and Access page. Important: This tool is currently only accessible from this page and there is no way to access this page again. If the tool needs to be used, use it the first time through. To access the tool, select the access user management tool link. The next page explains that this tool will lock the account. If you want to lock the account, select Continue (see Figure 1: Lock Account). The next page allows users to be added. 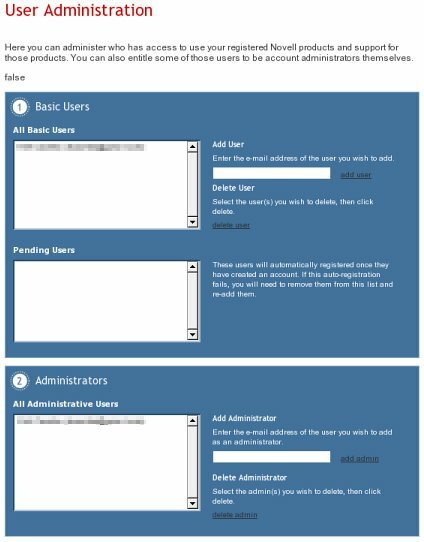 Once added, these users are able access updates with their Novell Accounts (see Figure 2: User Administration).